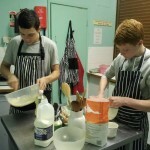 Some developments have changed the face of Cooking Nights at the Youth club on the Hill…..
First of all with the addition of new cooking volunteers to Grow Wild team, every Wednesday evening for the majority of April and throughout May, is to become a focus for food. 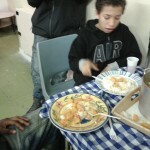 We began in October cooking one off treats such as toffee apples or pancakes and even chips……but there was little sharing of the end product, each young cook went off with their bag of goodies….. So to introduce a variety of foods and encourage social interaction, through discussion about food production and sourcing, we decided to change the emphasis of the cooking evening…. 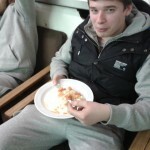 Cook Up & Eat Up sessions have been established at the club over, the last few weeks . 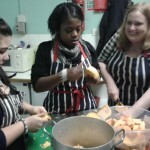 This is where a group of 4 to 6 club members each week are supported to plan and cook a main dish such as spaghetti or curry. Once the meal is cooked and ready to serve, we lay up the table and invite everyone in the club to sit and eat together. This project fulfills Grow Wild’s aims by encouraging greater social interaction and increasing awareness of healthy food. Grow Wild have started off by buying the ingredients for the evening session and setting up the kitchen for a group to cook together, ensuring the necessary equipment is in place. 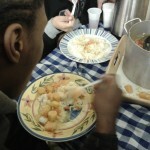 The group are taken step by step through the process of planning, cooking, serving and clearing up the whole meal. The session runs from 6.30pm to 9.30pm, so we usually try to get the meal on the table by 8.30pm, with washing up and clearing started by 9pm. 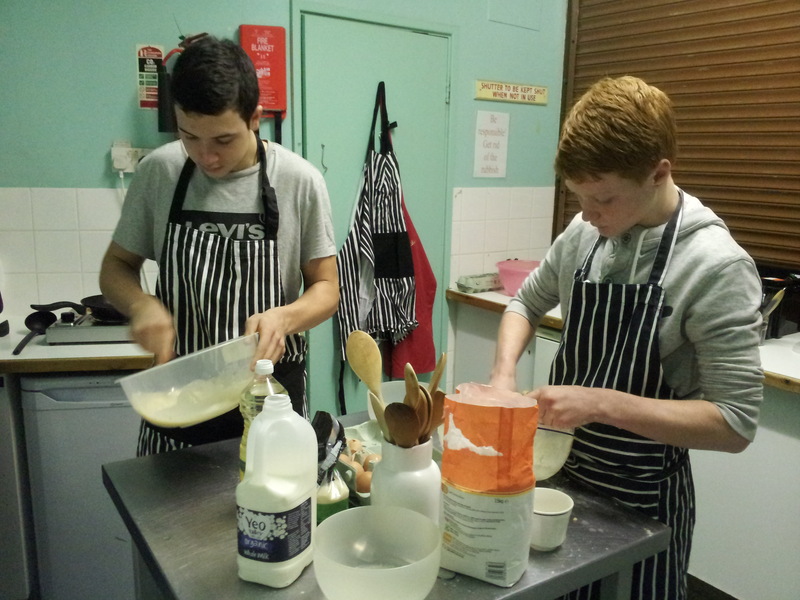 The sessions are lively and fun as well as informative and creates a bonding and communal focus within the large group of young people who frequent the club every Wednesday evening. 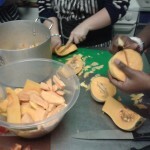 So far we have had successful spaghetti, then sweet potato and pumpkin curry nights, with the club members coming up with a list of future meals they wish to become involved in cooking…. Fancy Jerk Chicken, lasagne, Dumplings, Brownies, Chicken Soup, Vegetable Kebabs, Pies or Bangers and Mash? What are we cooking up next? 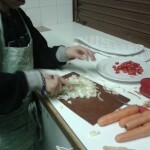 On Wednesday 10 April the club will be making pizza from scratch, we will make our own dough setting it aside to prove, make our own tomato sauce and selecting our own toppings…..Some of us are buying the ingredients, Grow Wild is providing the recipe, 8 of us have agreed to arrive at 6.30 to give us enough time to cook a pizza for everyone at the club…it is going to be a busy night….What’s your favorite pizza topping?